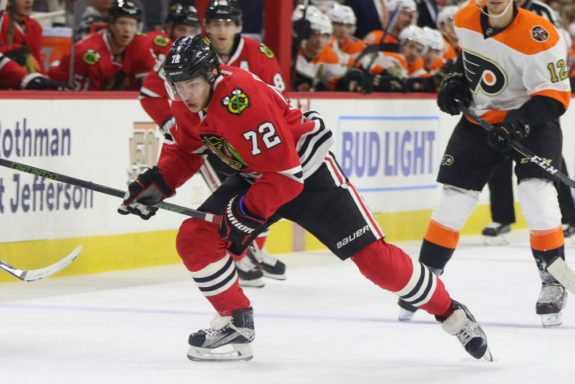 The Chicago Blackhawks have traded forward Artemi Panarin along with forward Tyler Motte and a 2017 sixth-round draft pick in exchange for forward Brandon Saad, goaltender Anton Forsberg and a 2018 fifth-round draft pick. This deal comes just minutes after the Blackhawks officially shipped veteran defenseman Niklas Hjalmarsson to the Arizona Coyotes in exchange for Connor Murphy and Laurent Dauphin. The Blackhawks are trading away the 25-year-old Panarin after two incredibly successful seasons with the team. In his rookie season following his jump from the KHL to the NHL, Panarin scored 30 goals and 77 points in 80 games en route to the 2016 Calder Memorial Trophy, awarded annually to the league’s top rookie. Following up that impressive showing in his sophomore year, Panarin scored 31 goals and 74 points in 82 games and earned himself a two-year contract extension that would pay him $6 million per season set to kick in at the start of the 2017-18 season. While playing on a line with Artem Anisimov and Patrick Kane, it was clear that Panarin fit in perfectly with what the Blackhawks were trying to accomplish. Anisimov was putting up career numbers with the Blackhawks with Panarin on his left flank and Kane was sitting safely atop the league’s point standings each year with Panarin’s skill and creativity opening up lanes for him. Panarin will now join a team in Columbus that appears to be on the cusp of something special while Saad rejoins his old team in Chicago. Brandon Saad is no stranger to the Chicago Blackhawks lineup. He was drafted by the team with the 43rd overall pick in 2011 and proved to be a tremendous two-way forward with scoring potential in his three seasons with the team. Winning two Stanley Cups with the Blackhawks while playing alongside captain Jonathan Toews and often veteran forward Marian Hossa, Saad was a young player proving to have a high ceiling and a championship pedigree early on in his career. With the Blackhawks unable to come to terms on an extension for Saad, the team made a trade that sent him to Columbus ahead of the 2015-16 season. 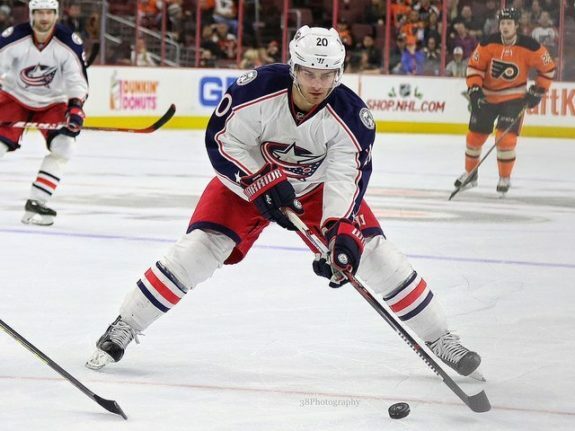 Saad was sent along with forward Alex Broadhurst and defenseman Michael Paliotta to the Blue Jackets for Anisimov, Marko Dano, Jeremy Morin, Corey Tropp and a fourth-round pick in the 2016 NHL Entry Draft. He has scored 55 goals and 106 points in 160 games since being traded, including 31 goals in his first season in Columbus. Saad is also signed to a deal that will pay him $6 million per season, though his deal lasts for four years rather than Panarin’s two – a factor that might have been taken into consideration when making the swap for the Blackhawks.